My bathroom, back in the beginning. You can survive without power relatively easily. But if you're living off-the-grid, your biggest concern is water. Life without it just isn't sustainable. I'm located in the south of Turkey where there is no rain for 5 months of the year. I have no running water on my land. As you can imagine, H2O has been on my mind a lot. If you have a government supply, all well and good. But if you don't, there are some ingenious water solutions out there. It is possible to be independent even in quite dry conditions. Having spent many hours on Google, and a lot of brain-racking, I've learned a fair bit about getting water from one place to another (namely in a tap somewhere near your house). Here are a few ideas. This is perhaps the most obvious. Dig for water, it's got to be there somewhere right? Not necessarily. 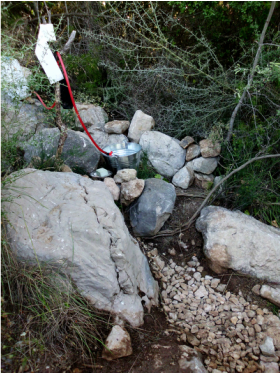 The positive side of a wellspring is that you have an independent and usually clean water supply. The downside is, they are horrendously expensive things to create. It's a hit and miss affair as to where that elusive water is, so you either need a very talented dowser, or a big bank account. Drilling typically runs into thousands of dollars.Then you need pumps to get the water out, and pumps require power. 2.Diverting water channels, streams etc. If you have a stream anywhere near your land, you probably aren't reading this. Why would you? You're set up. However, streams have a downside. They are not reliably clean for the most part. I have a water channel running about 200 metres below my land. While pumping it up has been a struggle due to the steep gradient, it is possible.The snag is, the water isn't clean. It's fine for watering plants, but not OK for bathroom or kitchen use. A solution to this is eco-pools and filtering plants.You can create a tiered pool system with the reeds in the top pool to clean the water. This water then feeds into your lower pool, which is now suitable for swimming, or use in the bathroom. You need to circulate the water between both pools to keep it from stagnating. See this clever idea. You could potentially drink your own shower water! But it takes time and money to make pools. It's a great long-term project, but right now you are on a budget and you need water. Luckily there's a third option. It comes as a surprise to many, but the Mediterranean skies actually provide gallons of free water. The Romans were big rainwater harvesters after all. You can still find the ancient cisterns all over the south coast of Turkey. Whilst the climate is bone dry in summer, winter makes up for the loss.The Turkish Mediterranean enjoys between 750-1000mm of rainfall a year.The only catch is, it all falls in three months.This means you need something set up to snare it and store it. In the UK the average roof will give you 24 000 tons of water a year... And on the Med? One more roof ready for rainwater harvesting. Your roof is the best rainwater harvester you'll find. Metal roofs are better than tiles.Thatched roofs can't harvest rain. Earth roofs can, but it'll be slightly dirty. Rainwater harvesting for metal roofs. 11 mm of rainfall produces 1000 litres of harvested rainwater for every 100 m2 of roof area. We said the rainfall in southern Turkey was between 750-1000mm per year. So with a mere 10 m2 of roof you could harvest at least 6000 litres of water. 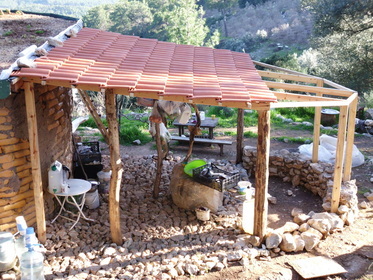 Rainwater harvesting for tiled roofs. 16 mm of rainfall for tiled roofs produces 1000litres of rainwater for every 100 m2 of roof area. 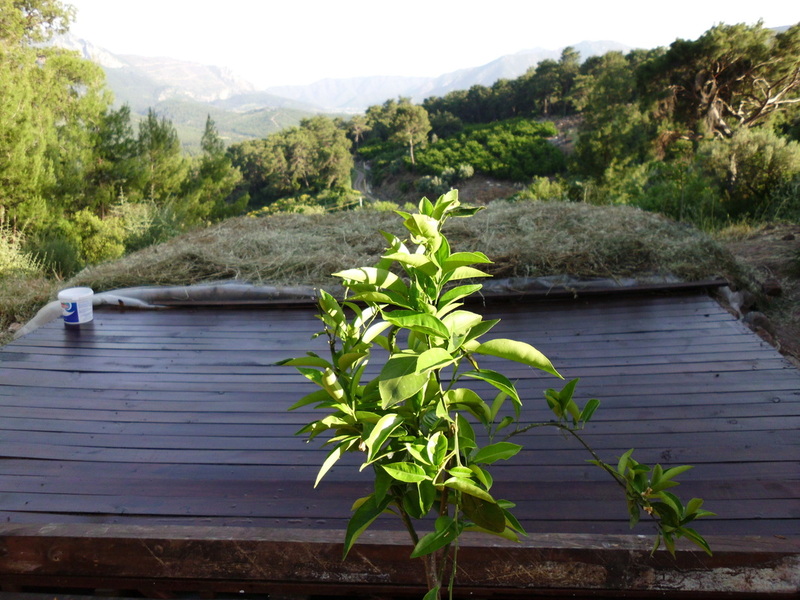 In the Mediterrean or south Turkey that will bring you at least 4500 litres of harvested rainwater from 10m2 of roof. Deck used to catch water in a 5000 litre pool. Having currently no alternative water supply I have used every surface I can find to harvest rain; decks, roofs, plastic funnels. The results have been exciting. I now have 10 000 litres of water stored. I'm living alone so my personal usage is minimal. I have no washing machine, and recycle all my water. If you're interested in how that lifestyle works,THE BLOG has the story on how I made it without running water for 18 months. Basically you can easily survive on 1 ton of water a month if you're careful. So I've calculated that 5 tons should see me through the summer. The real water-eater will be my garden though, hence the additional 5 tons in the large pool. The issue with rain-harvesting is less how to catch it, as how to store it. Now that is an eco-nightmare. It's terrible stuff, surviving for millions of years no matter what you do to it, unless of course you burn it and fill the air with poisonous gases. I've had to make some tricky decisions. At the beginning of my adventure, I banned concrete from my land. But without concrete how can you create a cistern? For now I hang my head in shame because it's all in plastic tankards. But I'm not to be beaten. 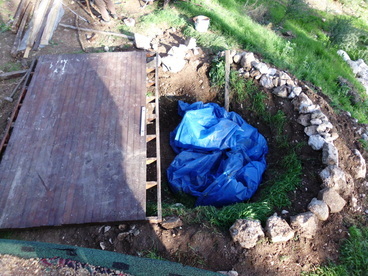 Next year's project is a clay pool. If the Romans can do it, so can I. Seven tons of water now stored under the platform. Who would ever know?